Andy Jones and Paul Sargent put in some work in this new video from SLVRANDBLK Films! Filmed in glorious Bristol, the birthplace of Portishead (yay! ), Massive Attack (yay!) and Damien Hirst (ugh). Yoyos used are the YoYoFactory Replay Pro. Andy Jones and Paul Sargent put in some work in this new video from SLVRANDBLK Films. We love watching these guys play! Filmed in glorious Bristol, the birthplace of Portishead and Massive Attack (yay!). 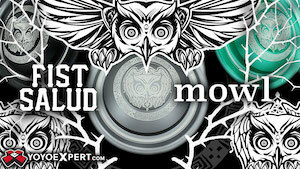 Yoyos used are the YoYoFactory Replay Pro and Smashing YoYos Monocle. Joey Montoya dropped a great video to hold up his spot on Gentry Stein’s “Shutter Crew”, a small team of players picked by Gentry as kind of a “junior team”. Great tricks…keep an eye on this kid! Yoyo used is the YoYoFactory Replay Pro. 2014 World YoYo Champion Gentry Stein dropped a pretty exhaustive Q&A video on his YouTube channel…almost 12 minutes of everything that the fans want to know. Solid. World and National YoYo Champion Gentry Stein had a 9 hour layover in Paris. So he did what anyone would have done - crammed as much into that 9 hours as possible. Yoyo used is the YoYoFactory Replay Pro. World and National YoYo Champion Gentry Stein had a 9 hour layover in Paris. So he did what anyone would have done – crammed as much into that 9 hours as possible. YoYoFactory and CLYW players team up for another Basecamp yoyo video. It’s always a good time at Basecamp! Check out the latest collaboration video between YoYoFactory and CLYW players, filmed with the help of a blacklight that really makes the string pop. Featuring Igor Galiev, Petr Kavka, Eric Koloski, and Tony Sec. Yoyos used are the YoYoFactory Replay Pro, YoYoFactory Dogma, and Basecamp Jackknife. Michael Malik has joined the YoYoFactory team! Looks like his really nice 2nd Place finish at the TYC event back in March turned some heads…well, that and his great style and sweet tricks. 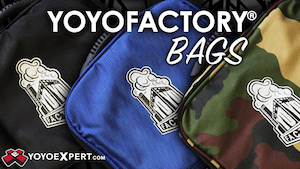 Check out Michael’s welcome video, and congratulations to both Michael and YoYoFactory! Hell yeah! YoYoFactory is doing an entire collection for team member, National Champion, and all-around awesome guy Eric Koloski! Looks like the first announced model in the collection is a crazy neon pink Replay Pro, and of course Eric rips with it. Of course. We’re looking forward to seeing what other models are announced for this collection…nice job, YoYoFactory! You know what I love about Eric Koloski? Besides the fact that he’s pretty much the nicest guy in the world and one hell of a yoyo player, Eric has this awesome thing he does at contests. He gets on stage, and all of his backup yoyos are different. He’ll step up with one yoyo in his hand, and then put three or four different ones on the stage as his spares. Why? Because he knows that they’re all fine, and they will all do all the tricks, and it’s really not that big a deal. And he still crushes some truly amazing freestyles, consistently, with literally whatever is in the top of his bag that day. True yoyo professional, right there. Yoyo used in this video is the YoYoFactory Replay Pro. YoYoFactory team member Michael Stecz wandered into the woods wearing a shirt with an all-over print of deer on it. That alone is worth watching, really. But as a bonus, we also get a couple of minutes of excellent yoyo tricks! So basically, everyone wins with this video. There are few things that Ben McPhee from YoYoFactory loves more than a good adventure! This new YoYoFactory Adventure video finds Gentry Stein trekking through the Havasupai region of the Grand Canyon. Great tricks, beautiful setting. Yoyos used are the YoYoFactory Shutter and Replay Pro. YoYoFactory Poland dropped a new video featuring local player Jakub Plader, and it’s another great look at just how damn good the Replay Pro really is! For $16 this yoyo can handle pretty much anything, and it’s definitely the biggest winner in the plastic department for 2015. Great tricks from a rising talent! YoYoFactory has proven time and time again that they know how to make yoyoing look amazing, and this new video is just above and beyond. Filmed on location in Iceland, this YoYoFactory Adventure features Czech national treasure Vashek Kroutil doing what he does best…smooth-as-hell tricks that make you want to pick up a yoyo and practice. 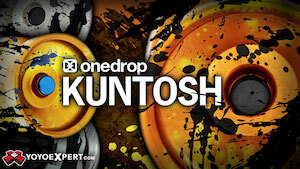 Yoyos used are the YoYoFactory Replay Pro, Dream Titanium, and Czech Point. All the way from Poland we get this video featuring Krzysztof Adamczyk! It’s amazing how much better plastic yoyos have gotten in the past few years, right? Yoyo used is the Replay Pro by YoYoFactory. Luke Finnell and Ibrahim Rahman, better known as second-tier superheros LUKE & IBS, have dropped another pile of gold in our laps with their latest video. Shot as a promo for the “so good it almost doesn’t need promotion” new signature model for Gentry Stein, this new video is a gentle reminder that one day, Luke and Ibrahim will destroy the Earth and rule us all Luke and Ibrahim are awesome.